Earlier this week, individuals from CRES Forum and affiliates of the Conservative Energy Network joined together on Capitol Hill in Washington, D.C., for a “fly-in” event in order to speak with numerous Members of Congress and/or their staffs on how clean energy benefits and is supported by voters in their home states. The topics discussed included recent polling (both nationally and in individual states like Texas, Ohio, and Minnesota) that point to increased interest in clean energy policy among Republicans and the need for the GOP to offer practical alternatives to the Green New Deal. 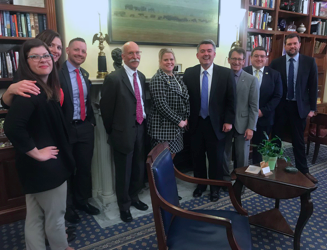 Fly-In Participants with Senator Cory Gardner (R-CO) during a March 13th Meeting. In all, 56 people attended representing 15 states including Arizona, Colorado, Indiana, Iowa, Michigan, Minnesota, Nevada, New Mexico, North Carolina, Ohio, Pennsylvania, South Carolina, Texas, Utah, and Wisconsin. Between all of the groups, a total of 62 meetings were held in Republican offices, including Senate meetings with Senators Mike Braun (IN), Richard Burr (NC), Ted Cruz (TX), Joni Ernst (IA), Cory Gardner (CO), Lindsey Graham (SC), Chuck Grassley (IA), and Tim Scott (SC). Additionally, 14 energy innovators from the Clean Energy Business Network held meetings with Democratic and Republican offices to showcase their innovative energy technologies. There were also networking events for all of the fly-in participants to meet each other and discuss their work in clean energy. States, municipalities, and businesses nationwide have begun to realize the potential that clean energy innovation holds for spurring job creation and strong returns on investment. This week’s fly-in was a unique opportunity to highlight these successes at the state and local levels for each Member of Congress from actual constituents. With the power of social media and television, perhaps we’ve lost perspective on how important it is to make a personal connection to be effective advocates. In fact, of all of the ways to communicate with a Member of Congress, studies have shown that in-person meetings are the most impactful. Face-to-face opportunities like our fly-in this week are critical—the old axiom “all politics is local” remains truer than ever precisely because electronic media has so inundated policy discussions. We are grateful to all the state energy leaders who traveled to Washington, and it is very reassuring to know we can count on them in the future. View more photos of the fly-in on CRES Forum’s Facebook page.